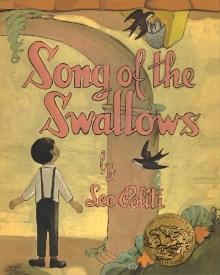 If you have young children, I highly recommend Leo Politi’s delightful book Song of the Swallows. It is the simple story of a young boy named Juan and his friend, Julian, the garden for the California mission where the story is set. Each spring Juan and Julian anticipate the arrival of the swallows and rejoice in their return. To them, and to the children of the mission, the swallows are not only a sign of spring but also dear little friends. I confess. I have a somewhat less affectionate view of the little creatures – sort of a love/hate relationship. If, like in the story, these little birds came each year to make their home amidst my beautiful and well-tended flower garden, thus adding to the charm of an already enchanting scene like that of the mission,then I’d feel exactly like young Juan. Unfortunately, our swallows don’t nest amidst my immaculate flower garden (to be fair to the birds, I don’t have one -just planted pots and a few flower beds). Instead they nest in our garage – lots of them. They and their blessed offspring poop all over everything. We can’t park our cars in the garage from March until August. Walking through the garage, one runs the risk of being dive-bombed my frantic swallow mothers eager to protect their young or, at the very least, being hit with some of the afore mentioned poop that covers the garage floor. Seriously, it can be really scary to walk through my garage in the summer. On the other hand, we have no mosquitos. Have I ever mentioned we live on a river. We live on a river and have no mosquitos! I guess a little poop it worth that. I guess. So, Welcome Swallows!